FreshMail also offers post-paid, open-ended contract accounts as well. For rates and other information regarding these plans, please contact us. 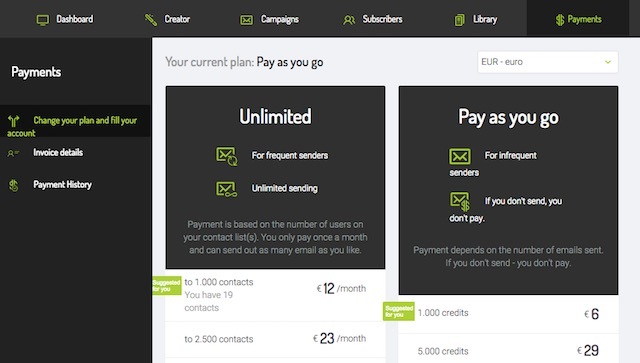 Go to 'Payments' on the dashboard of your FreshMail account. After selecting a plan from the options presented, you will then be asked for the relevant information needed for the transaction. 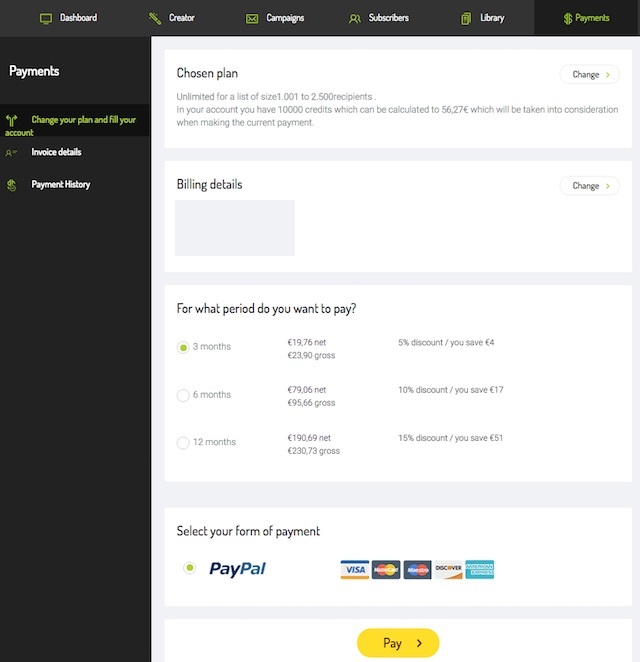 After filling everything in, you can click the PayPal icon. You will then be taken outside of FreshMail to the website of your chosen service to complete your payment. How long does it take to credit a payment to an account? Online payments are credited almost immediately, though we sometimes may need up to an hour for your FreshMail account to be credited. In unusual circumstances, your account may not be credited until the end of the next working day. If you have any problems related to payments or the good standing of your account, please contact our team and we will help to clarify the situation immediately. Your financial account information is never stored on FreshMail's system or servers. FreshMail uses external sites like PayPal to complete online transactions. Like millions of others, we use these services because of their commitment to maintaining the highest standards of security and data encryption. If you have subscribed to FreshMail services as a private individual rather than a company, you have the right to cancel your order within 14 days by sending an email with your login to the following email address: support@freshmail.com. However, after you have used our services, in both plans Unlimited and Pay As You Go, you will not be entitled to a refund. All refunds will be credited to the payment card originally used when placing the order.